Machu Picchu has become so crowded that it is very odd to call it a lost city of the Inca. 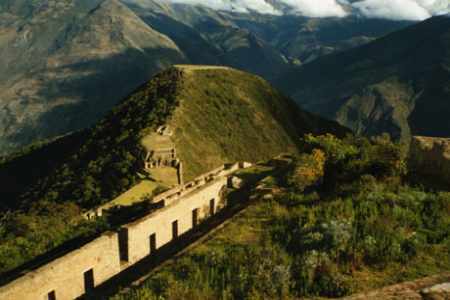 Well, here is you second chance to discover a truly lost Inca city: only a 100 km away! Inside the city, just off the main square in the distance, the hill-top is on the left. People write books and blogs about their journey of discovery to Machu Picchu. What they mean is discovery of a quite corner, perhaps somewhere beyond the higher southern structures, very early in the morning, when they can enjoy the city for 15 minutes before being over-run by flash cameras and having to descend to the decadence of Aguas Calientes. Machu Picchu is one of those things you can’t miss, even if you hate crowds and band wagons. It is undoubtedly gorgeous and profound. However, all that “lost city” stuff sounds like a cheap cliché these days. What is so lost about a shiny train, a bunch of new coaches, international cuisine, inflated tourist trap prices, tactical formations of retired Japanese and millions of North-American kids screaming for mommy? Machu Picchu is a Very Much Found City of the Inca. Peru is the land of adventure and this is why I came here. Yes, I enjoyed Machu Picchu; it was beautiful. But it was no adventure. Then I heard of Choquequirao. And… I smelled fish. Another city nearby, bigger than Machu Picchu? You mean a proper lost city where no-one goes, close to Cuzco? What’s wrong with it? Is it just a bunch of rocks? Or are you giving me another “lost city” pitch? Too good to be true? I mean, it’s not that unknown – a few tour shops in Cuzco advertise it, yet it falls on deaf ears. I went, I saw, I surrendered. It was the best decision of my Peru trip. Choquequirao was stunning. And it was true. The reason I had it all to myself? There is no luxury train! Simple as that. O tempora, o mores! I know there are thousands who dream of a genuinely lost Inca city they can enjoy in solitude and serenity. This article is for you. Believe me, this is what you are looking for when you wince from the Inca Trail hype in Cuzco. Choquequirao: 3030 m altitude, 60 km round-trip over 5 days, transport: none, terrain: gorgeous. The starting point for the trek is Cachora, a charming sleepy village at the bottom of a valley. A bus from Cuzco drops you off just before it gets to Abancay. You have to spiral downwards for two hours to get to the village. Once there, things were easy to find. Cachora is the mule depot of the mountain range. There is a pretty basic hotel, a basic place to eat some potatoes or soup, and a basic shop to buy basic provisions. Water is not essential if you have purifying tablets – you will come across many springs on the way. I’m not sure, but I think they pretty much pull whatever villager is available when you ask for a guide. They are all good anyway. 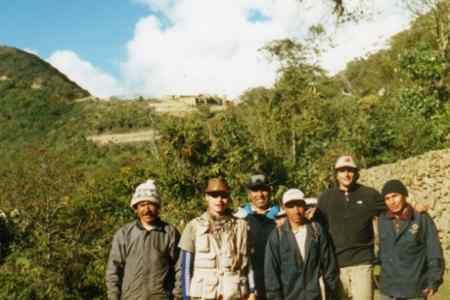 Our guide for the trek was Victor – a farmer who had done the 7-day trek to Santa Teresa 12 times. Luigi and me (my buddy) also rented two mules: one for the backpacks and one for riding, if required. 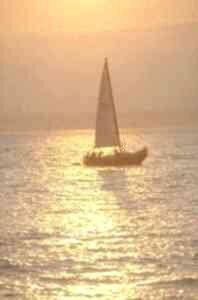 The first day is a gradual shedding of civilisation. We went through the village, kids running after us, adults smiling and wishing good luck. Then some farmland with an occasional campesino. Then an abandoned hacienda and a short forest trail, and, finally, the mountains. For three hours or so it was a leisurely promenade on a wide flat trail. The serenity…just the birds, the sun and the peaks bathed in sunlight. The road wound round the bends like a picture on a box of chocolates: at every corner a new view, more impressive than the one before. A wall on the left, a drop on the right, and a bunch of summits as far as the eye can see. Later, the soil changed from grey rocks to red powder and we began our descent into the Apurimac river valley. We reached the Chiquisca camping station right in time for the dark. It was no more than a cleared patch of wood, 20 m in diameter, looked after by a 14 year old girl living there in almost total solitude. That was the most institutionalised accommodation we were to encounter for the rest of the trail. We woke up in the clouds, literally. They were all around us. You could wash your face in them. Our guide took us to the edge of a cliff and pointed out the task for the day. A vertical wall going all the way into the sky, the trail a thin cord zigzagging schizophrenically over its face like a crack. It looked totally intimidating. But first we had to come down into the valley and cross the Apurimac river that separated us from the wall. So we did, slowly, savouring the stereotypical scorched cactus scenery of the valley. The bridge was modern and strong (I guess the government attended to that in search of some tourist revenue). Finally, the ascent: 3 hours of mind-numbing grunt work. Left, push, right, push, left, push, right, push. Water was going by the gallons. But the views were unobstructed and once you detach from the physical effort you mind floats in the mountains. Three hours later we came across a few huts (Santa Rosa settlement) and rested with one of the owners. We stayed for a while, tired and soaking up the sunny afternoon with our numbed brains. Could have stayed there forever. Then another 2 hours of grunt-work ascent and we break the gradient – finally there, on a flat top. Looking back at the thin silver string of the river down in the valley, I couldn’t believe we got so far. There were a couple of huts at the top. We camped outside the house of the local bear hunter, an amazing guy full of life. He warmly welcomed us to his wife’s cooking. The reason he is so happy is because from his porch you can see the most beautiful sunset panorama on the planet. The ceremonial truncated hill-top dominates the complex. View from the ceremonial hill-top: main square with palaces and temples in the centre, living quarters and fortifications above, agricultural terraces below. The entire population of the city for the day (ie us) on the main square, level with the top of the rainbow. The invisible population of Choquequirao: archaeologists. I am second from the left. Next morning we got our first sighting of Choquequirao just a few steps from the settlement. But it took another one and a half hours of beating the trail to get there. We dived into the woods, stepped out of a bush and there we were – on the terraces of the Lost City, just like that. No gates, no tickets, not a soul. Choquequirao was actually first discovered way before Machu Picchu. However, it is less well preserved and the excavation works are more recent. To date, only about 30% of it has been recovered – mainly the top (and most important) part. The slopes are still largely buried. How does it compare to Machu Picchu? I hear you ask. Well, it doesn’t. They are different cities altogether. Choquequirao is built very differently, more conventionally. Palaces, religious structures, living quarters and military constructions surround the ample main square. Many of the buildings are 2-3 stories. The city is dominated by a magnificent ceremonial hill with the top chopped off and turned into a religious arena and an observatory (six of the peaks and two of the rivers sacred to the Inca can be viewed from here). The slopes hold a vast number of structures, from simple shacks to well-preserved large agricultural terraces. 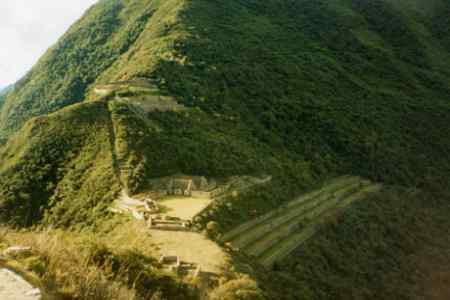 The overall area covered by Choquequirao is 1810 hectares, much bigger than that of Machu Picchu. Choquequirao is more than just a pretty face. They call it a sister of Machu Picchu, but I would call it a brother. While the Virgins of the Moon were dancing around in MP, Choquequirao kept everyone fed and safe – it was the administrative, military and economic centre of the whole area, as well as a bearer of a strong religious significance. Choquequirao is where the remnants of the Inca had their last days. The archaeological work here is slow due to inaccessibility and low funding, but it seems that what they do find makes Choque more and more significant every year. Choquequirao is a genuinely lost city. Harshly inaccessible from either side, it is no wonder it never got discovered (even in our days of New-age Machu Picchu worship!). This little corner of paradise is firmly locked by the guardian mountains. They isolate this spot from the whole world, like a ring of soundproof padding. There is only the low-flying condor and the rainbow reaching the city from the bottom of the valley. We could almost touch that rainbow. But that’s still not the best thing about Choquequirao. Lost in the middle of nowhere, surrounded by silent mountains, it was absolutely empty. And with that comes freedom. There was an invisible team of archaeologists somewhere, my guide Victor, two Austrian guys I came with, and an English / Peruvian explorer with his loyal Sancho Panza. Yet it was still the end of the high season. No ticket booth, no security, no supervision, not even a toilet. It was all up to our ethics. We were not on a tour, we were guests here – the camping ground was on one of the terraces. We wandered wherever we wanted (respecting the archaeological restrictions), day or night. Choquequirao is particularly magic after nightfall, if you have the guts. It’s not for the faint-hearted to walk around the ruins surrounded by wilderness, hearing whispers of ghosts and wondering which sacred grounds you are trespassing. Choquequirao was the jewel of my trip. Sure, Machu Picchu is gorgeous and if you are looking for convenience, you can be there and back in one day. Choquequirao takes 4 days of hard walking and that is why it is so serene, challenging, profound and rewarding. It is a true Lost City. You get back the same way you came. For me, the journey to Choquequirao was the first leg of the 7-day trek over the mountains to Machu Picchu (if you wanted to know whether that could be done). But that’s another story. The above trek took place in August 2002. There have been some changes, although minor. The entry to Choquequirao is now purchased at 10 soles; this lasts you as long as you want. The camping on the terrace now includes toilets and an emergency line with Cachora. The destination is also getting more popular, although still far from crowded. Iin the high season of July / August 2005 there were an average of 50 visitors on site plus about the same number en-route at any time. Hurry before they build a railway! Doing the trek over 5 days (the third day spent entirely in Choquequirao) is well worth it but if you only have 4 days, that can be done too. The downside to that is you only get 1 hour on site: you carry on straight to Choquequirao on your 2nd day, have a tour in the morning and set off, arriving to the Apurimac river crossing by night. For any treks to Choquequirao make sure you have adequate footwear and you are accustomed to the altitude: that second day will get you sweating and your ankles twisting! Click the camcorder symbol above to watch a video of nearby similar Machu Piccu. 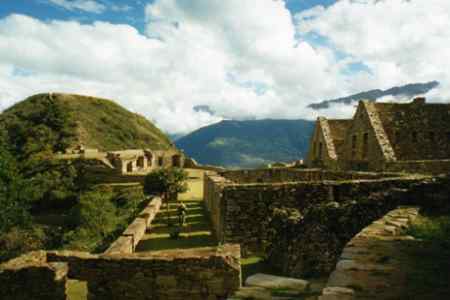 Treks organised for you: to Choquequirao and Machu Picchu! If you enjoyed reading the above article then you will probably also enjoy El Salvador by Alex Welsh, and The Amazon, also in South America, and our latest articles covering the Orinoco Delta, La Mata, Marbella and Beijing.